I've reviewed a number of issues of the Gail Simone/Walter Geovani Red Sonja, and throughout the run, ending here with issue 18, I've found the series getting progressively stronger. In the first arc, Simone's script was broad and Geovani's action was stiff, and while there was an interesting emotional backdrop to the story, I think it took much of that first arc for each creator to find the nuance in their collaboration. Sonja can be blunt, but she's still human. But Simone and Geovani grew into that understanding, particularly in the book's incredibly strong second arc, and they kept building the series - and the growing supporting cast - up from that understanding to create one of the best character-driven fantasies you could find in your comic shop from month to month. In Simone's final arc on the book, Sonja finds herself guarding a library in a remote kingdom ruled by a cruel empress. The women there, ascetic nuns who live to host the stories contained in the Spire, could not be more different than lusty, illiterate Sonja, who has no time for libraries. But something about these women speaks to her, so when the empress comes to burn down the library and slaughter the women in it to prevent them from teaching the peasants how to read, Sonja stays and defends them. In this final issue, the empress' elite assassins, the Vipers, approach, giving Sonja a fight to the death she cannot win for a cause she neither supports nor understands. 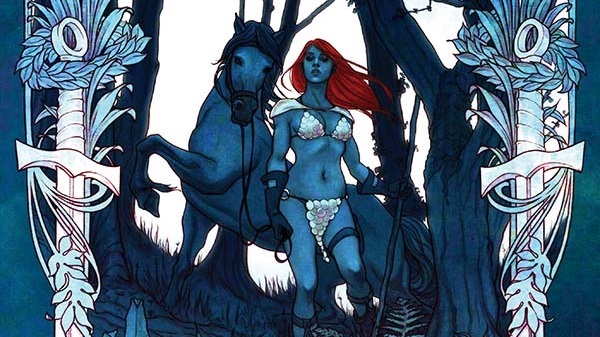 Perhaps my favorite thing about Red Sonja from Simone's second arc on is one of scale. I'm used to fantasy comics - and, hell, superhero comics - that are all about escalation, about a series of threats that range from city-destroying at the minimum to universe-destroying once every couple years. But after the army-on-army conflict of her first arc, the series has pared back the scale of its destruction with each successive arc. The stakes here are comparatively low: Four nuns against three assassins trying to burn down one library, the hopes of literacy for a populace. But in reality, the stakes have never been higher: Can Sonja do what's right even if she doesn't understand or care why it is? Can she better herself as a person? Will her story live on? It's not that Simone's writing here has gotten any less blunt with the character than it was when she first began, but she's figured out what Sonja's bluntness means to her, how to use if effectively to tell simple, emotional fantasy stories. Indeed, the stories got progressively more character-driven as the conflicts got smaller, allowing Simone to explore the importance of forgiveness, the inspiration of storytelling, and the necessity of a good lay throughout the series. The book was often blunt about its themes and about the beats Sonja went through, but I don't really consider that to be a bad thing when they make sense within the context of the stories we're being told, and Simone cleverly found a way to ground the series in her world-view. As Simone improved, so too did her collaboration with series artist Walter Geovani, albeit in fits and starts. I have criticized Geovani's action compositions as being lifeless and difficult to follow with any energy, but Simone has given him more room to stretch his skills in design and, in this most recent issue, in fairy tales. 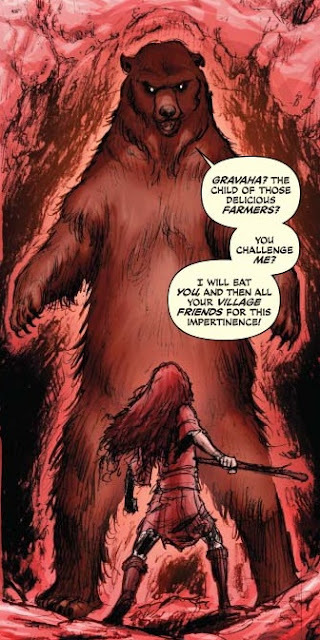 The dark, moody story of Gravaha was the most impressive work I think I've seen from Geovani, with thick, inky blacks coalescing around the intimidating bear god, Gravaha herself seemingly a half-finished little figure against his enormity. Geovani's action still doesn't quite do it for me, but he was an important player in creating Sonja's entire visual world, which I think he excelled at. The book's action sequence is tight, but runs into a lot of the same issues with regards to how it's paced on the page - sequence, point-of-view, etc... - that cause it to loose a little bit of the kick I might want from a climactic battle. Or even, if I'm being honest, a basic action sequence. 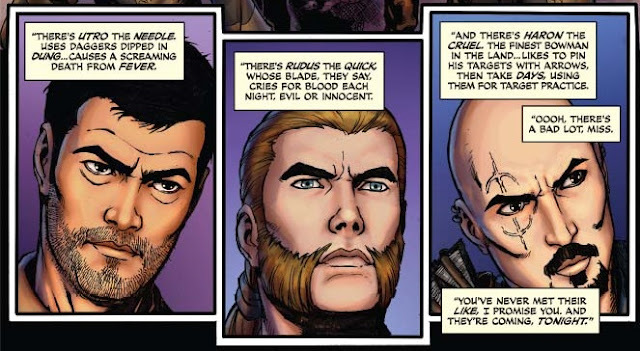 Geovani's art is polished as all hell, but Simone writes combat as if it should be gruff, dirty, even brutal; this fundamental inconsistency undermines some of the series' charm. Simone's tenure on Red Sonja run was brief, but memorable. There's no shortage of excellent fantasy out there, with books like Skull Kickers and Rat Queens standing out as some of the smartest books on the shelves each month, and, for my money, Simone's Sonja stands with the best of them. For all that the series had its flaws and was never able to fully overcome them, Simone and Geovani did some incredibly strong work on the title. Red Sonja is a character who I've always held at arm's length, a mish-mash of fantasy tropes about 'strong female characters' with an iconic costume but little else that stuck with me. While Simone and Geovani are almost certainly not the first people to find a beating human heart beneath the scale bikini, they're the first who have done so for me. 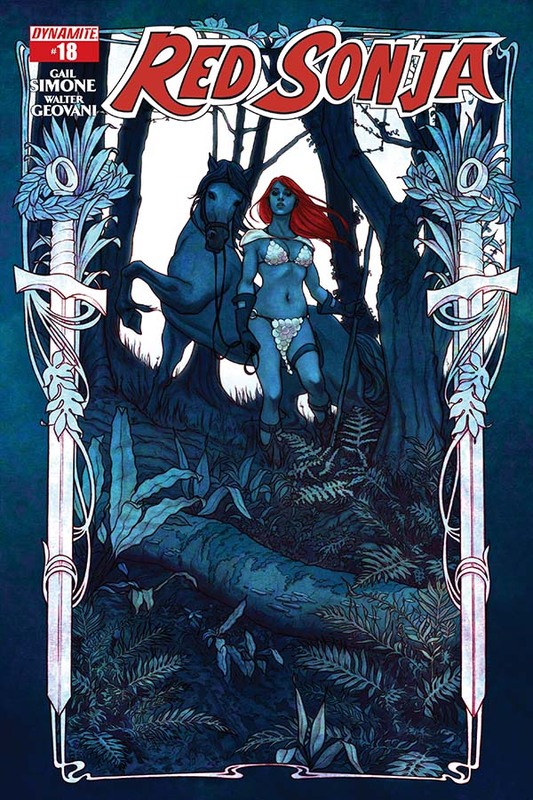 With Red Sonja #18 bringing the series to a solid conclusion, the pair have crafted the perfect place for new readers to jump on and get a feel for Red Sonja as a warrior, as a woman, and as a character.